'Lullaby Isle' (Teresa Martin, R. 1978). Seedling #75-GM-3-1. 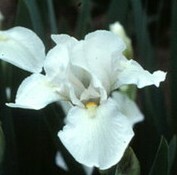 IB, 18-19" (46-48 cm), Early to midseason bloom. White self, white beard yellow deep in throat. Greenlee seedling #65-7: ('Fi Lee' x self) X 'Meadow Brook'. Martin 1980.